Two Thousand and Sixteen might be the first election in history which is a referendum on the challenger and not the incumbent or their legacy. To great effect, Hillary Clinton and her large faction of the complicit and often supine media have successfully absolved her of almost every one of her failings and controversies by perpetually making the assertion that what Donald Trump has said is worse than what Hillary Clinton has done. Words are now more important that deeds. Saying you care is more important than doing good works. It is important to be generous with other people’s time and money. It’s time to get back to the facts. The most powerful man in the world, Richard Nixon, walked away from his office in part because he deleted eighteen and a half minutes of tape which were under subpoena and the Washington Post went into a two-and-a-half-year frenzy. Hillary Clinton deleted 30,000 emails from an unsecure personal server, while they were also under subpoena and the Post yawns, unable to muster even the charade of professional interest. Liberal corrupt double standard? You bet. And if something doesn’t change soon, Hillary is about to become the most powerful person in the world. Richard Nixon, by every metric, was a deeply paranoid man. He demonstrated outright contempt for liberals and their sycophants in the media. When cornered and caught in lies he portrayed himself as a victim, being “kicked around.” The most telling flaw was his inability to accept even the notion that he was wrong. Hillary Clinton, going on over 200 days without a press conference, manufacturing an “alt-right” movement that is out to get her and dismissing every criticism as personal seems to place her well down the Nixonian path. Jean-Paul Sartre famously said “I am the architect of my own self.” We are the sum of what we do, yet Clinton has cast herself time and time again as the victim of a “vast right-wing conspiracy.” A seeming paranoia that a clandestine force is out to sabotage her life, and yet every time she has been caught behaving, at best questionably and at worst dishonorably, she has completely abandoned any form of responsibility or accountably. Only retroactively claiming that she “regrets” a decision. She behaves like a child caught in a lie. Or maybe as a child, even her imaginary friends wouldn’t play with her. When the email scandal first broke: Clinton said she did what I did out of “convenience” and everything was “approved and legal.” Then when we found out that wasn’t true, she said “I regret the decision” but "I never sent or received classified documents while Secretary of State." Then when that wasn’t true she said “I never sent any material that was marked classified"
To be fair, I think we can all agree she’s been “short-Circuiting”: for some time. Clinton makes a seemingly firm statement but it is always just vague enough to back out if she’s caught. When she’s caught she falls back on the next iteration, and again, and again, and again. Meanwhile, her proxies and allies focus on identity politics, asserting her unpopularity is due to sexism and politics. The mere fact she has and continues to believe in a “vast right wing conspiracy” by definition demonstrates a paranoid and persecution complex, just as Richard Nixon possessed. Plus, it shows she hates legitimate opposition, thus showing a supreme lack of character, a prohibition to the presidency by the reasoning of the Framers Jay, Hamilton and Madison. But they are just “dead old white guys,” by the sophistry of Hillary’s lovers. Hillary’s delusion of persecution by reason of her recent rant again the “Alt Right” shows a paranoid personality. If she is elected, Hillary will be the most distrustful president since Richard Nixon, which explains much. As a member of the committee created to prosecute Richard Nixon, she displayed a disqualifying hatred and unethical behavior that got her fired. Shakespeare said the eyes are the windows to the soul. Nixon had the eyes of a deeply troubled individual. Hillary’s eyes are just the same. Hillary---deeply disturbed and possibly in need of clinical assistance----would have fit in perfectly in the paranoid Nixon White House. 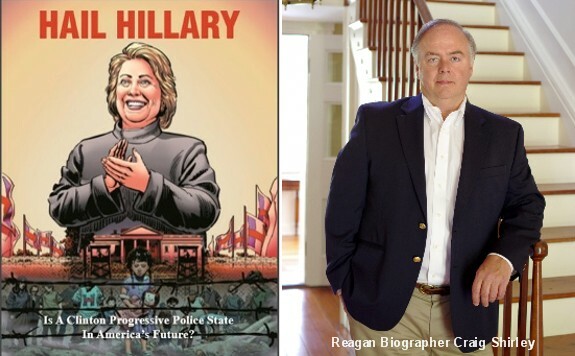 Craig Shirley is the Visiting Reagan Scholar at Eureka College, is a presidential historian and is the author of four books on Ronald Reagan. He is also the author of the New York Times bestseller December, 1941. Submitted by Shandor on Fri, 09/23/2016 - 12:35.